When Trevor Kenkel started experimenting with aquaponics eight years ago, he worked out of his garage. 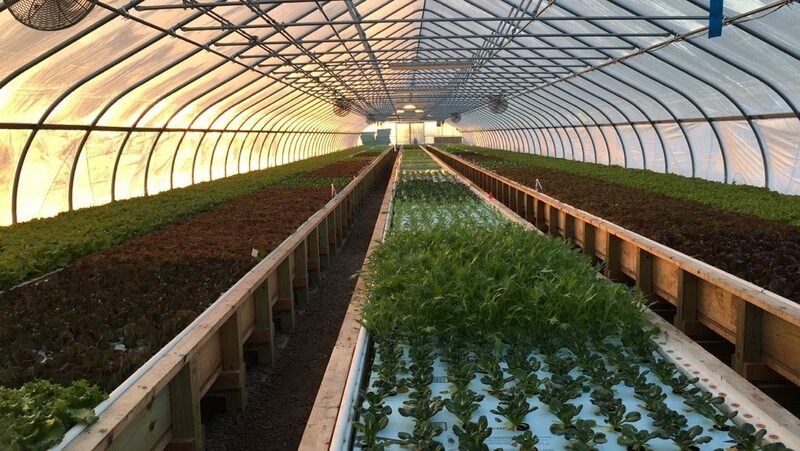 Now, he has a 7,800 square foot greenhouse in Maine where he grows vegetables and raises fish in a hyper-efficient, closed-loop system — all without any soil. “We are 10 times more productive than traditional farming,” Kenkel says, explaining that his Springworks Farm saves two million gallons of water every year by shifting water back and forth indoors between tilapia tanks and lettuce troughs instead of letting it evaporate in soil outside as conventional farmers do. “Crazy how much water lettuce takes to grow, right?” he says. “The industry is moving towards more water conservative techniques, but there’s only so much you can do because you are still trying to moisten the area around the plant rather than actually having the cleaned water in system like we do.” With his Springworks Farm, Kenkel not only demonstrates that aquaponics can work on a commercial scale but also sells tabletop aquaponics systems for homes and classrooms, to encourage others to get started. An aquaponic farm is a miniature ecosystem. By recycling water between fish tanks and the troughs where vegetables grow, farmers can keep both happy: the plants can feed on the nitrogen, phosphorus and calcium in fish waste, and the fish get a continuous supply of clean, plant-filtered water. In short, aquaponics combines hydroponics and aquaculture, growing plants without soil while also rearing fish. Aquaponics is catching on, and not just in Maine. In California, hundreds of people have attended aquaponic workshops, and in Wisconsin alone at least 60 aquaponic operations have opened over the last five years. In Brooklyn, you can now buy aquaponic lettuces from Whole Foods, and in Canada, a food bank for the poor set up its own aquaponic system. Last year, a single manufacturer, Nelson Pade, sold about 200 systems, at prices starting at $3,000 each. Growing demand for organic fish and produce is helping. “Certainly there’s an increase in the consumers in the U.S. who want more naturally grown organic food,” says Chris Hartleb, a fishery biologist at the University of Wisconsin-Stevens Point who has been teaching an aquaponics course for years. Like many others, Kenkel was initially attracted to aquaponics by environmental concerns: he didn’t want to use synthetic fertilizers. Having grown up in rural Montana, he saw how fertilizer pollution from traditional agriculture damaged local ecosystems. “I stumbled upon aquaponics through hydroponics because I was looking for more sustainable fertilizer sources,” Kenkel says, adding that fish waste is a great option for that purpose. He also discovered that with aquaponics he could produce local organic vegetables all year around. And in a world that’s eating more meat than ever, fish are a vastly more efficient way to provide protein than raising cows or pigs. “You might get half a pound of fish back for every pound of food you feed them,” explains Dickson Despommier, a professor emeritus of environmental health sciences at Columbia University. “If you feed a pig one pound of food, you’ll get one hundredth of a pound of meat back. If you feed a pound of food to a cow, you can’t even measure the tiny return in protein produced,” says Despommier. Outdoor aquaponics, using ponds, has been popular in Southeast Asia and China for hundreds of years. Moving the practice indoors offers much greater efficiency, but also requires much more responsibility for the farmer, who is in complete control of the system and must maintain its delicate balance. “Once you move indoors, you are Mother Nature,” says University of Wisconsin’s Hartleb. So aquaponic farmers have to think like engineers, strictly controlling temperature, oxygenation, lighting and water flow. They also have to be mathematicians, calculating growth rates and devising mixtures of species that maximize yields. Because the fish and vegetables are interdependent, changing one variable can shift the entire system — for better or worse. “If I try a different fish, can I still harvest lettuce every six weeks?” Hartleb asks. If the new species produces less fertilizer, it might take 10 weeks to grow lettuce instead, making the farm much less profitable. The complexity of aquaponics, and the risks that go with it, are one of the reasons why its spread has been steady but not spectacular, experts say. There have been frequent failures, according to Fred Conte, an aquaculture specialist at the University of California, Davis. “You might read about an aquaponic farm in the newspaper, and two years later, they sold the company,” he says. Innovations and marketing skills play big roles in determining who thrives, says Conte. For example, instead of competing against massive conventional farms that sell to big food retailers, an aquaponic farm could decide sell to high-end restaurants that support the concept. Another hurdle is that most aquaponic farmers raise tilapia because they are tasty and relatively easy to care for, but consumer demand for the fish may have peaked, says Hartleb. “[W]e are getting to a point in the U.S. where we are making as much tilapia as people want,” he says. Farmers might want to switch to higher priced species like salmon, which can sell for about $16 a pound, roughly four times the price of tilapia, according to Hartleb. But salmon is also more sensitive to temperature, and thus harder to raise. “With some risks, comes reward,” Hartleb says about raising salmon for their higher price. An aquaponic farm in Blair, Wisconsin, he adds, plans to produce 16,000 heads of lettuce a day while raising Atlantic salmon. Springworks Farm’s Kenkel thinks that aquaponics is poised for growth, especially with growing concerns about water availability. “It’s gained a lot more attraction recently, especially with California having issues with its drought,” says Kenkel. And he plans on expanding his business.